Dr. Larry Peabody, the lead TOW teacher at Bakke Graduate University has a weekly blog based on his research for his new book "Curing Sunday Spectatoris: From Passivity to Participation in Church". The latest entry of his blog is an interview with Dr. Dotun Reju from Jos, Nigeria. What can we learn from our African brothers and sisters about practicing participatory church? This is the audiobook version of Joy at Work by Dennis Bakke, narrated by Dennis Bakke, 9 hours 28 minutes. To download one track at a time, click on the link provided. This will take you to a folder in mediafire with all 57 tracks. Click on each title to download. To download the whole folder, click on the green button with the down arrow at the right top of the page in mediafire. In Joy at Work, Dennis W. Bakke tells the true story of this extraordinary company--and how, as its co-founder and longtime CEO, he challenged the business establishment with revolutionary ideas that could remake America's organizations. It is the story of AES, whose business model and operating ethos -"let's have fun"-were conceived during a 90-minute car ride from Annapolis, Maryland, to Washington, D.C. In the next two decades, it became a worldwide energy giant with 40,000 employees in 31 countries and revenues of $8.6 billion. It's a remarkable tale told by a remarkable man: Bakke, a farm boy who was shaped by his religious faith, his years at Harvard Business School, and his experience working for the Federal Energy Administration. He rejects workplace drudgery as a noxious remnant of the Industrial Revolution. He believes work should be fun, and at AES he set out to prove it could be. Bakke sought not the empty "fun" of the Friday beer blast but the joy of a workplace where every person, from custodian to CEO, has the power to use his or her God-given talents free of needless corporate bureaucracy. In Joy at Work, Bakke tells how he helped create a company where every decision made at the top was lamented as a lost chance to delegate responsibility--and where all employees were encouraged to take the "game-winning shot," even when it wasn't a slam-dunk. Perhaps Bakke's most radical stand was his struggle to break the stranglehold of "creating shareholder value" on the corporate mind-set and replace it with more timeless values: integrity, fairness, social responsibility, and a sense of fun. Who makes the important decisions in your organization? Strategy, product development, budgeting, compensation—such key decisions typically are made by company leaders. That’s what bosses are for, right? But maybe the boss isn’t the best person to make the call. That’s the conclusion Dennis Bakke came to, and he used it to build AES into a Fortune 200 global power company with 27,000 people in 27 countries. He used it again to create Imagine Schools, the largest non-profit charter-school network in the U.S.
I’ve gone to lots of conferences. Sometimes they are tailored for inspiration, sometimes for information, sometimes for indoctrination, sometimes for integration---of peers and ideas. The ICETE Conference held on the plush beaches of Playa Bonita, Panama, this November, had some of all of this, but with a supreme purpose of struggling with one singular theme---“How do we address the ‘secular-sacred’ divide that has seduced many evangelical Christians into posturing a religious bent on one day of the week, or consigning Christian professionals into the metaphoric airline “first class” of evangelism while lay people are relegated to the “economy class” of so-called “secular occupations”. ICETE, deciphered, is the International Council of Evangelical Theological Education that brings together hundreds of bible colleges and seminaries that are networked into a dozen or so formal accrediting associations, that extend around the world The conference itself meets every three years to tackle a contemporary theme. This year, 460 theological academics, book publishers, and Christian trainers gathered, representing 75 nations, and over 200 institutions to tackle this very contemporary theme. 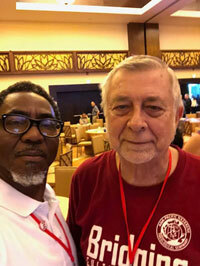 Dr Oladotun Reju of Jos, Nigeria and I, a North American, teaching in the Philippines, shared the key address on the first day to introduce our commission to teach “Theology of Work” and “Business Ethics” in many venues in Africa, Asia and beyond, thanks to the financial grants of Mustard Seed Foundation. Using the metaphor of “Left-Handed Warriors” (Judges 20:16), as a motif similar to “lay people”, we reviewed the theological premises of “work”, noting that God introduces Himself as a worker, and then creates human beings to expand on His work as the meaningful basis of worship. We talked about the “Creation Mandate” of Genesis 1 and 2, that stands equal with the “Redemptive Mandate” of the New Testament. We discussed the profound influence of the Theology of Work initiative as presented by Mustard Seed Foundation, noting that it is now eleven years old, and allows us to teach in some of the most restricted countries of the world. Within the joint presentation, a theological framework was offered, and numerous resources referenced. Our own participation from many countries fed case studies into the address. To see our presentation, click here. We noted that the MSF TOW program has awarded 414 grants to institutions that have engaged 59 lecturers and professors, in sessions have exposed 55,000 participants to the themes. However, a new major shift in the allotment of grant funds was introduced, encouraging local ICETE-related organizations to find qualified teachers who would be mentored by core MSF-assigned professors, tutored through a formal course, in an arrangement that would credentialize them to receive scholarship funding, and a commission to formally teach these courses under Mustard Seed auspices. A detailed description of this new initiative was made available to all participants and can be downloaded here. Overall, there were ten “take-aways” for me from the five days in Panama. Mustard Seed Foundation, in conjunction with Bakke Graduate University, has made the decision to focus a significant part of the TOW grant program to resource and train ICETE School faculty to integrate TOW (Faith and Work) concepts into their curriculum. The course: How to Teach Marketplace Ministry in Your School offered by Bakke Graduate University and the International Theology of Work Grant Program for Seminary professors will help facilitate this transfer the knowledge of TOW from the classroom to the street. The pilot class will begin January 14, 2019and conclude on March 10, 2019. The name of the ICETE School where you are teaching. The country where that school is located. The discipline of study you currently teach at the school. The class is limited to 25 people. We invite ICETE Schools to participate in sending their faculty members to take part in the course. See details about costs and MSF granting here. Schools from other ICETE regions are welcome to take this course as well if there is room in the course.